They are doing the traveling George was talking about it seems. Say bye bye to chest picture !! Joanna I look forward to seeing his bare chest everyday when I come here. Is Tuscany considered a day trip from Como? Just wondering if they are on an extended trip or just a day's field trip. The mr and mrs clooney site has more info. Donnamarie wrote: Joanna I look forward to seeing his bare chest everyday when I come here. So sorry Donnamarie....He'll be back another time I'm sure. I think Tuscany is more than a day trip away from Lake Como. Unless they just biked to the private jet of course ! annemarie wrote: The mr and mrs clooney site has more info. Thanks annemarie I checked it out. Barely saw the backside of Amal in one pic. So glad the two of them can get out and explore Italy. We know George is very familiar with the country but don't know if Amal has seen much of it. From an Italian site some repeat pics and a couple we haven't seen. 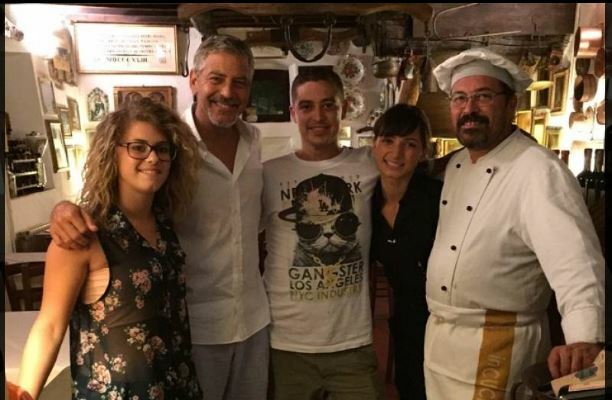 Florence, July 29, 2015 - That George Clooney loves to madness Italy is well known, just consider that Lake Como has also set up home (and home ...). This summer the actor did not want to jump her around the boot, focusing on Tuscany. Clooney, in fact, it has been noted in Chianti with his wife, the English lawyer of Lebanese origin Amal Clooney, and the couple did not fail to stand out above all for the way casual and "low profile" of tourism - Clooney and Amal They went around aboard a Vespa Piaggio and a Fiat 500 - and then to the appreciation that have reserved the typical Chianti. 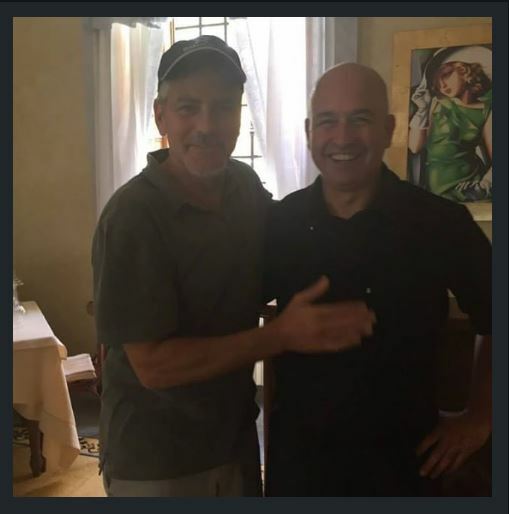 As reported by the Gazzettino of Chianti, in fact, on Monday Clooney he was spotted in Panzano in Chianti, farm Montebernardi, where did not fail to taste the wines of the region, while on Tuesday the star had lunch at Locanda di Pietracupa in San Donato Poggio and dined in the cellar of Rignana in Greve in Chianti. And the two have always been very polite with everybody, lending itself to the usual photos and autographs. I think it's great that they are out and enjoying Italy , I love the pictures but wish people would give them some privacy. annemarie wrote: I think it's great that they are out and enjoying Italy , I love the pictures but wish people would give them some privacy. Do we need to follow every of their steps? Need to know what they do every day? They are on a vacation, shouldn't we give them some privacy? Feel the same annemarie and carolhathaway. We can thank social media for the almost daily intrusion. But George seems very good natured about it. I think he knows where to draw the line. It occurs to me that he understands that for folks he meets along the way it's a big deal to have their photo taken with him. It stands to reason they are pleased he has chosen their establishment. By the same token Amal is taking a pass on these photos - which also makes total sense to me. I can't think of many things nicer than a trip through this part of Italy on a motorbike in the summer. George is posing for pictures with the staff of a commercial enterprise that, he well knows, will post them for publicity. When he wants to be underground and go 'private,' he can and will be. That, apparently, is not the case now. We know he's in Tuscany with his wife because he wants us to know he's in Tuscany with his wife. I think he is trying to have a normal life without hiding, but I think it is still not necessary to post every picture taken with him. He's just being polite and taking pictures with the locals who ask. I don't think there's any bigger agenda about him wanting us to know he's in Tuscany with his wife. But people are going to read into it whatever they want. I just don't see Amal as a motorbike holiday type of woman. No room for all her luggage on the bike. I assume they have a van with all her stuff right behind the bike. I think all the pics from Italy are planned pap shots. George does the same shots every year. I assume a lot of celebs do the same thing. And of course, he knows business owners will post their selfies for PR for their business. I don't remember him doing any shots like this with any of his girlfriends. He was always in Laglio or Switzerland never very far from home. I think Amal will do whatever George likes if it makes him happy and I think he would do the same for her. I think this is the trip he talked about while promoting his movie them on his motorcycle traveling. This is when I separate myself from some of those here whose rhetoric revolves around how George stages his life around pap shot opportunities and PR manipulation. What I see is George enjoying life with his new wife and being the friendly outgoing guy he has been for years. 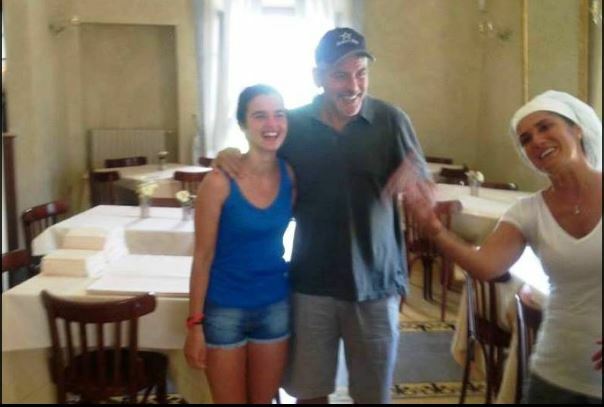 He goes to a restaurant in Italy and the management and staff love him being there. They ask for a pic and he obliges because he's a nice guy. And he knows it will probably bring publicity to the restaurant. And that's a good thing. He doesn't care about the publicity. He has more than his share. My opinion. That was so much fun! I got to use my first greenie. I feel like a kid in a candy shop. This motorbike trip in Tuscany is new but the other pics from Italy this summer I've seen "before". I don't think George stages his life around pap shots but the part of his life that we get to see contains staged pap shots. This is George working," being George Clooney". Amal is wearing the Valli short suit that she wore last summer. I agree with Silje: perhaps Gio (and his girlfriend) are near with a van for their clothing during this motorcycle tour. Who knows...one of them might be taking some of the "exclusive photos". 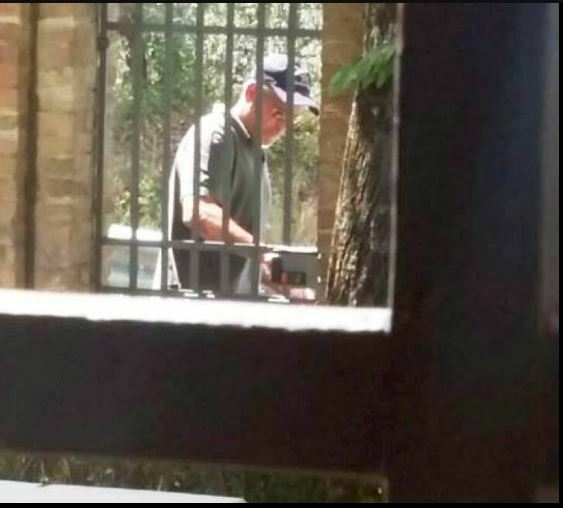 Donnamarie wrote: This is when I separate myself from some of those here whose rhetoric revolves around how George stages his life around pap shot opportunities and PR manipulation. Maybe I'm naive (and don't mean that you're naive as well) but that's exactly what I think. Of course George knows that these photos will be published but should he reject to take them? This wouldn't be nice to his fans so it's the lesser evil that everybody knows where they are. But for me there is also a difference between the photos that were taken where George is posing with Restaurant staff etc. and those who were taken secretly like the one with Amal and the one taken through the window. 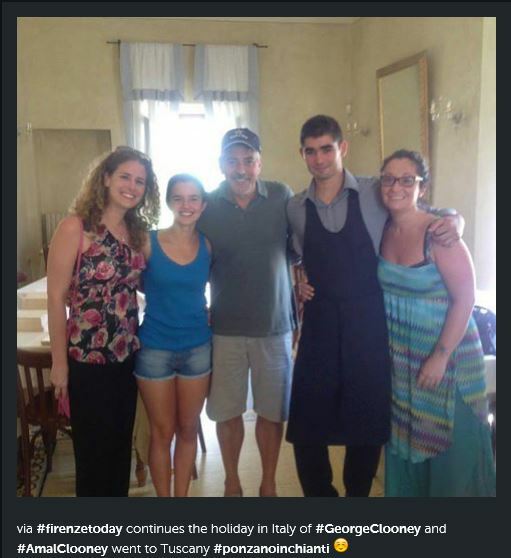 I'm sure the Clooneys are happy to have their pic taken at a local place for that place!s benefit. Remember when they left Tina Brown's place and he asked to take Harold Evans' book cos he knew the paps were outside? my guess is that they agree knowing they're on their way out and long gone! Pan your probably right they are somewhere new by the time the pictures are posted. his trip he said he didn't because "it was very scruffy"
Really.....some people don't value older places. Yes.....around Rome with Gregory Peck and not much traffic ! that get in their way. I expect Gio is following behind on his bike. He'll know the right swear words in their local language. Just a thought.....I wonder if they're viewing properties on their travels ? For the record, I'm not reading any agenda into George's actions, and I don't think these particular shots are staged. All I'm saying is that there is no need to fret over George's privacy in this instance, because he obviously is not trying to keep it. Otherwise, he'd be somewhere else, doing something else, in private. I'm sure George and Amal have had lots of private moments. I love G's loafers. I like his whole outfit. The women staff at the restaurant are so cute. They seem to be in a tizzy over George. And he seems to be thoroughly enjoying it. It just annoys me sometimes that the public feel it's o.k to take pictures of celebs and post them. I'm talking about the sneaky pictures where they aren't agreeing to be papped in a private moment enjoying themselves somewhere in public. you both have made very interesting points. I'm sure George knows that photos that are taken with him will be posted in most case - like the photos Sevens took at the premiere of Tomorrowland in Shanghai. And I'm also sure that's part of his job, that's why he's paid well by studios and companies like Nespresso or Omega. But to me there's a difference between these photos and those who are taken secretly (are least I think they are taken without his knowledge). In my opinion even a celebrity has the right of a private and normal life. The pic was taken by someone in his group or in his employ, riding in a vehicle alongside the couple. It makes its way online, so it would be with his consent. Paparazzi tracked them down and snapped the picture while they are enjoying themselves. 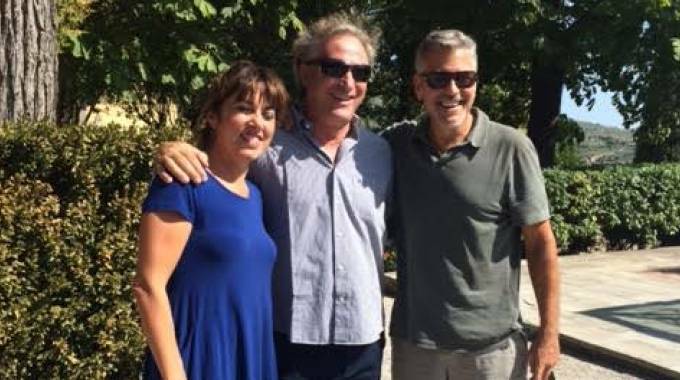 But, Clooney, one of the most famous men in the world, has himself let it be known that he and his wife are tooling around Tuscany on a bike, thus ensuring the inevitable search for them. Either way, he is not looking for privacy. And he is the one with ultimate control over how the scenario developed. Neither scenario makes him not a nice and generous person. It also does not make him a publicity hound with nefarious motives. It just is what it is. All pictures fans like and love to see. No harm to anyone if George not mind alls nice. Looks like they are having a good time. Lucky people to meet with George and get their picture taken with him. I read that they have a Fiat 500 as well as a Vespa. Perhaps Gio is in the Fiat and has the luggage with him. I hope Amal doesn't mind having 'helmet hair'. Hebe, that sounds like fun. Maybe he still has connections with fiat. Didn't he do some funny adverts for them? It does look like they are having a good time . I read the same thing too Hebe. That they have a Fiat 500 and Vespa while they are moving around locally. Haven't seen or heard anything about Gio. I would hope that they were on their own. Just each other. But logistically don't know how they are managing both vehicles?? Annemarie, they do look like they are having fun. How could anyone not have fun tooling around Italy eating, drinking and taking in all that beautiful scenery. If they are based in Tuscany maybe they have rented the vespa for day and the fiat for night use. Apologies...the pictures are shown in a DM article in today's paper.